First let me say entire books have been written on how to boost your SEO! So these next few hundred words aren’t meant to be all-inclusive. 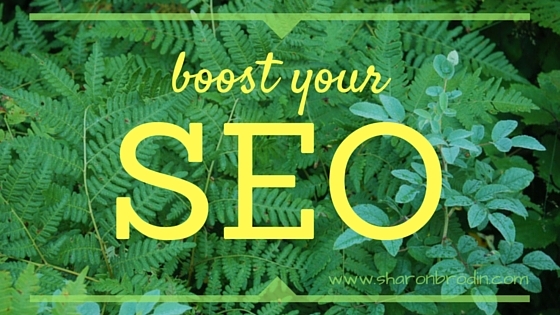 But I’ll give you 9 tips that will boost your SEO and help your prospects find your website. SEO isn’t something you can change in a day. A strong online presence is built over time. But it’s not haphazard. There are strategies you can use—easy strategies—to boost your SEO a step at a time, week after week. Once you have your list of keywords and keyword phrases based on what your audience is looking for, start to develop content around them. One page per keyword phrase, and one keyword phrase per page. Near the beginning of the content, preferably the first paragraph. As ALT text in your header image. In one or more subheads in the content. Remember, though, no “keyword stuffing.” Search engines now penalize pages using this tactic. The keywords should fit naturally in your content and be truly helpful to your readers. Both internal and external links will enhance your SEO. Internal links take your reader to related content within your site. External links take your reader to related content on another website. This is part of being helpful. Make your navigation easy to follow. Let them know what to do and where to go next. Keep your images and media optimized for fast loading. All of this will encourage your visitors to stay longer, too. Write and post content on your website that helps your readers learn, solve a problem, answer a question, find a solution. This content will be based on the keyword phrases you’ve discovered your prospects use. Never copy-and-paste articles, blog posts, or newsletters from other sites onto yours. Not only is it copyright infringement, it’s bad for SEO. You’ll be penalized for duplicate content. Quoting and citing is fine. Plagiarizing isn’t. In April of 2015, Google announced it would start giving mobile-friendly websites priority in its search engine rankings. If your site still hasn’t jumped on the mobile train, it’s time! Not just because Google wants it. But because over half your visitors are on mobile devices—and they want it! I touched on this briefly already. Optimize your images and videos so they open quickly. Not only is it better for SEO, it’s better for customer conversion. Online users are extremely impatient. If they have to wait more than a few seconds for your content to load, they’ll simply leave. Share your content on your social media platforms. When you promote your new posts and updates on your social profiles, you’re getting in front of your connections again. The ideal outside link is from a well-known and respected website in your industry. Having a link from a reliable source back to your site tells the search engines (and your readers) your site is reliable, too. How can you earn links from others? Add value, offer to help. Interview an influencer and write a blog post. Assuming it’s top-notch, that influencer will gladly link to it. Write articles for online industry publications that will give you a byline and link. One more for good measure: If you have blog posts and articles more than a year old, go back and revise them both for any content changes they need and SEO. If you tackle one or two a week it won’t be an overwhelming task. If you use WordPress for your website like I do, try the Yoast SEO plugin. (I use the free version.) I love it because it’s easy to use and lets me know right away what’s working and what needs improvement. What do you do with your visitors once your SEO draws them to your website? Don’t let all your efforts go to waste!